AMIST Super is committed to respecting your right to privacy and protecting your personal information. We are bound by the provisions of the Privacy Act 1988 (Cth), which contains thirteen Australian Privacy Principles which regulate how AMIST Super collects, uses, discloses and keeps secure your personal information. When you entrust us with your personal information, we know you expect us to protect it and keep it private. Although AMIST Super is referred to throughout this document, generally it is the company contracted by us to administer the Fund, Australian Administration Services Pty Limited, who collects, stores, uses and discloses your personal information on AMIST Super’s behalf. Sensitive information is a sub-set of personal information which includes any information or an opinion about your racial or ethnic origin; your political opinions; your membership of a political association, a professional or trade association or a trade union; your sexual preferences or practices; your religious beliefs or affiliations; your criminal record; and your health or disability status (including genetic and biometric information). What types of personal information is collected and why? The personal information that AMIST Super collects from you may include your name and address, date of birth, contact details including your email address, details about your occupation and employer and Tax File Number. We may also ask you to provide original or certified documentation to verify or support your personal information (such as your driver’s licence, passport or birth certificate). Where we collect your personal information directly from you, such as when you complete a membership application or change of personal details form, or when you send us documents containing personal information, we are required to obtain your consent to collect your personal information as part of this process. There may also be circumstances where your employer is required to provide your details to AMIST Super on your behalf, such as to inform us of your Tax File Number, employment status or contributions paid on your behalf. To establish and administer your superannuation and/or pension account/s, including processing contributions from you or on your behalf, investing in accordance with your chosen investment strategy, providing an approved insured benefit, regularly communicating with you about your account/s and paying benefits to you or your beneficiaries at the appropriate time. To comply with the customer identification and verification procedures required by the Anti-Money Laundering and Counter-Terrorism Financing Act 2006 (Cth) and corresponding Rules and Regulations. If you have provided your Tax File Number, to locate or identify your superannuation and/or pension account/s, report to other regulated superannuation entities (when transferring your benefits to that entity), and report to the Australian Taxation Office (ATO) in relation to co-contributions, spouse contributions and unclaimed monies. To send you relevant information on the products and services to which your membership gives you access such as financial advice. To consider your provision of goods and services to us or application for employment at AMIST Super through the staff recruitment and selection process. The personal information that AMIST Super collects from or about you may also be used for secondary purposes such as assisting AMIST Super to develop products and services suitable to our membership. In order to provide you with insurance cover, or assess your eligibility to claim a benefit, AMIST Super may need to collect information about your health (including medical reports, work experience and qualifications) and income. We may also need to disclose your health information to a third party for verification purposes such as the assessment of a medical condition. Your bank account details in order to action a direct debit to your superannuation account and/or make a pension payment into your nominated account. Information about your dependents, including details of their relationship with you, in order to determine an appropriate distribution of your benefit in the event of your death. Sensitive information will only be used and disclosed for the purpose for which it was provided, unless you agree otherwise or disclosure is required or authorised by or under an Australian law or court/tribunal order. Other than “c” above, we will always seek your express written consent before collecting sensitive information from you or on your behalf. AMIST Super is required by law to ask you to provide certain personal information. Wherever there is a legal requirement for us to seek information about you, we will inform you of the obligation and the consequences of not providing us with the requested information. If you do provide your TFN, AMIST Super may use it to identify any multiple accounts you may have with other superannuation funds and consolidate these into a single account of your choice. Your TFN may also be used to assist in locating “lost” superannuation monies collected by the ATO. AMIST Super’s use of your TFN is strictly controlled. Unauthorised use or disclosure of your TFN is an offence under the Taxation Administration Act 1953 (Cth) and can attract penalties including imprisonment and fines. If you choose not to provide the personal information that we ask for, or the information that you provide to us is incomplete or inaccurate, it may mean that AMIST Super will be prevented from efficiently managing your superannuation and/or pension account/s, offering you the full range of benefits and services that may be available to you and maintaining contact with you. You should be aware that if AMIST Super has been provided with insufficient information to enable us to properly identify or contact you, we may be obliged to transfer your account balance to the ATO. AMIST Super understands that anonymity and pseudonymity are important elements of privacy and that you may wish to have the option of not identifying yourself, or of using a pseudonym, when dealing with us. AMIST Super will allow you to remain anonymous or to use a pseudonym when dealing with us unless we are required or authorised by or under an Australian law, court or tribunal order to ask you to identify yourself or it is impracticable for us to deal with you unless you identify yourself. How may your personal information be disclosed and why? Generally AMIST Super will only disclose your personal information for the purposes for which it was collected. Our service providers and any of their sub-contractors, for the purpose of establishing and administering your superannuation and/or pension account/s. External agencies providing services for the purpose of data matching, cleansing or enrichment. Any survey company engaged by the Trustee to conduct a survey of members or employers, where the survey results will be available only to the Trustee. Medical practitioners and other relevant professionals when you apply for additional insurance cover or make a claim for a disablement benefit. In the event of your death, your legal personal representative, or any other person who might be entitled to receive your death benefit, or any other person contracted to assist us to process that benefit. Your employer, for the purposes of updating or confirming the accuracy of our records and determining your benefits. Financial advisors for the purposes of providing you with financial advice. Directors and Officers of the Trustee. Your spouse or former spouse or their nominated legal adviser in accordance with Family Law Act 1975 (Cth) requirements. Our auditors and other professional advisors. (APRA), the Australian Superannuation and Investment Commission (ASIC), the Australian Transaction Reports and Analysis Centre (AUSTRAC) and the ATO. Courts and tribunals, including the Superannuation Complaints Tribunal (SCT) and the Financial Ombudsman Service (FOS). Other superannuation entities in relation to a benefit transfer or rollover. Where your personal information is disclosed to service providers and other organisations, AMIST Super seeks to ensure that your personal information is handled in accordance with privacy laws and is not used or disclosed for purposes other than those for which you have been advised (unless otherwise required or authorised by or under an Australian law or court/tribunal order). Strict procedures are in place to ensure that our service providers have appropriate systems in place to comply with privacy laws and keep your personal information confidential and secure. If you apply for insurance cover, AMIST Super supplies the personal information that you provide on the application form, including health information, to our insurer so that they can assess your eligibility for new or increased insurance cover. If you make an insurance claim, you may need to provide AMIST Super or our insurer with additional personal and health information in accordance with our claims procedures. To assess your claim, your personal and health information may be disclosed by our insurer to medical practitioners and other experts nominated by the insurer. If there is any dispute about your entitlement to insured benefits, the insurer or AMIST Super may disclose your personal and health information to relevant parties involved in the claim or complaints resolution process. By signing the relevant application for insurance or claims form, you are consenting to the use and disclosure of your personal and health information for these purposes. AMIST Super has developed relationships with third party organisations in order to offer you value-added products and services. From time to time AMIST Super may use your personal information to contact you about these products and services. AMIST Super does not currently disclose your personal information to overseas recipients. 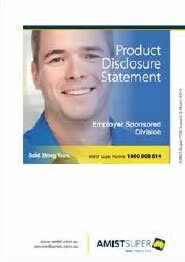 If it is necessary for us to disclose some of your personal information to an organisation outside Australia we will do so in a manner that is consistent with the privacy laws. AMIST Super may use mail houses to send you statements, newsletters and/or information about third party products and services. When this occurs, a non-disclosure agreement is signed by the mail house to ensure that your personal information is not disclosed to any other party and remains under the control of AMIST Super. If you do not want to receive marketing material from AMIST Super, you can contact us using the details provided below or use the Unsubscribe function on electronic communications. Please note that Newsletters sent to members for time to time are not considered “marketing material”. AMIST Super takes reasonable steps to protect your personal information from misuse, interference, loss, unauthorised access, modification or disclosure. We collect and store your personal information in a combination of secure computer storage facilities and paperbased files and records held in secure premises. A system of passwords and different levels of administration functionality is used to protect your personal information from access by unauthorised personnel. Your TFN is recorded in an encrypted form and destroyed when it is no longer required by law nor administratively necessary to retain. The personal information you provide to us is only retained for as long as necessary to fulfill the purposes for which the information was collected (unless we are required to retain the information under an Australian law or court/tribunal order). AMIST Super generally retains health information for many years in order to assist us in the event that a legal dispute arises. In all other circumstances AMIST Super will take such steps as are reasonable in the circumstances to destroy or de-identify your personal information. You have a right to know what personal information AMIST Super holds about you and to obtain access to it if required. You may access your information via our secure MemberAccess or EmployerAccess online facility or request access to your personal information by contacting us using the details provided below. You may need to provide proof of your identity before access is provided. AMIST Super reserves the right to charge a reasonable fee to cover any costs incurred in providing you with access to your personal information. There are circumstances where AMIST Super is not required to provide, or is prevented from providing, you with access to your personal information. Where access to your personal information has been denied or not provided in the manner reasonably requested, AMIST Super will provide you with a written notice setting out the reasons for our denial of your request (unless having regard to the grounds for the refusal, it would be unreasonable to do so) and the mechanisms available to you to make a complaint about the refusal. AMIST Super aims to ensure that your personal information is up-to-date and complete. You may change some of your personal information via our secure MemberAccess or EmployerAccess online facility or you have the right to ask AMIST Super to take reasonable steps to correct any personal information that you believe is inaccurate, out-of-date, incomplete, irrelevant or misleading, having regard to the purpose for which it is being held. You may need to provide proof of your identity before your information is corrected. Personal information AMIST Super has disclosed to another organisation will also be corrected at your request unless it is impracticable or unlawful to do so. If we do not agree with the corrections that you have supplied, we are not required to alter your information. In such circumstances AMIST Super will provide you with a written notice setting out the reasons for our denial of your request (unless having regard to the grounds for the refusal, it would be unreasonable to do so) and the mechanisms available to you to make a complaint about the refusal. We will not charge a fee to correct your information. If you log in to your superannuation and/or pension account/s using our secure MemberAccess or EmployerAccess online facility, AMIST Super will collect personal information from you including your name, contact details and any changes you make to your account. We can only collect personal information via our website with your consent, as you must log in and/or click on a ‘submit’ button provided on each web page before any information is recorded. You can only access the MembersAccess or EmployerAccess only facility with your member ID and password. You should keep your password secure and change it periodically. You should also ensure that you log off once you have finished accessing the MemberAccess or Employer Access online facility to ensure that no one else can access your personal information. There are security risks in transmitting your personal information via the Internet. You should assess these potential risks before deciding whether or not to use AMIST Super’s online services. If you would prefer not to transmit your personal information via the Internet, you can provide it to AMIST Super by mail or telephone. When you browse an unsecured area of AMIST Super’s website (i.e. an area where you are not required to login), our website provider will log the following information for statistical purposes only: the server address, the top level domain name, the date and time of the website visit, the pages looked at, the documents downloaded, previous sites visited, and type of browser used. AMIST Super won’t try and identify individual users or their browsing activities except in the event of an investigation by a law enforcement agency. If we include interactive tools on our website, such as calculators which require you to enter personal information, we will only retain this information where the calculator or similar tool allows you to save your information and retrieve it at a later time. The information stored will not be ordinarily viewed by AMIST Super. The AMIST Super website is “cookie free” which means that we will not send you any unsolicited information after you have accessed our website. It is our policy to only record and use your email address to communicate with you about your membership and entitlements if you advise us that you wish to receive email communication. Your email address will only be used by AMIST Super for the purpose for which you have provided it and will not be added to a mailing list. To help us to protect your privacy, always be wary of emails asking you to provide personal information via a hyperlink. AMIST Super will not use hyperlinks in unsolicited emails asking you to log in to one of our online functions. Instead we will refer you to our website and ask you to log-in to our MemberAccess or EmployerAccess online facility securely. If you have provided your email address but no longer wish to receive electronic communications from us, you can log in to the MemberAccess or EmployerAcces online facility and update your email profile, click the Unsubscribe link within the email you received or contact us using the details provided below. Where you have provided AMIST Super with your mobile telephone number we may provide you with information about your membership or entitlements with AMIST Super via text message or SMS. We will only use SMS to provide you with information about AMIST Super and your mobile number will not be disclosed to a third party. We will notify you if we become aware that there has been a loss of, and/or unauthorised access to, or disclosure of, your personal information and that loss, unauthorised access or disclosure is likely to result in serious harm to you. If we receive a privacy complaint it will be treated seriously and dealt with promptly, in a confidential manner, and in accordance with AMIST Super’s internal complaints handling procedures. In the event that your complaint is not resolved to your satisfaction, you may refer the complaint to the Office of the Australian Information Commissioner (OAIC) using the online Privacy Complaints Form, which can be accessed via the OAIC’s website at http://www.oaic.gov.au/privacy/making-a-privacy-complaint. The OAIC can also receive complaints via mail, fax or email using the details provided below. If you need help lodging a complaint, you can call the OAIC enquiries line on 1300 363 992.